You are sure to find the home you are looking for within our Benton Harbor resort. 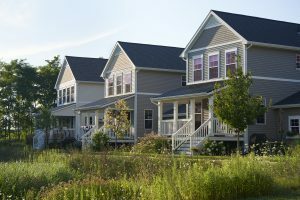 Our community is comprised of neighborhoods that feature a variety of home styles, layouts, and sizes. When you purchase one of our homes, you gain all the benefits that come with it such as easy access to Lake Michigan, and our award-winning Jack Nicklaus golf course. To speak with an expert agent, who is available to discuss all your available options within our Benton Harbor resort, and answer any questions that you may have, please do not hesitate to call 269-932-1600. If you would prefer to send us a message, please fill out the form found on this page, and we will contact you shortly. Our Benton Harbor Resort homes are within our illustrious neighborhoods. Such as the Fairway Signature homes, where golf enthusiasts can build their home within a gorgeous, maintenance-free community that overlooks our award-winning golf course. While the lawn-care and driveway clearing are included amenities, you will still have the ability to design and care for landscaping unique to your home. Harbor Shores’ Benton Harbor resort is conveniently located only 90 minutes from Chicago. We also offer a Homeowner for a Day program that allows you to come and experience our spectacular resort. These are guided tours that allow you to spend time with our Resident Ambassadors, who are familiar with the daily life within the community and will prove helpful when answering your questions. If you are ready to schedule your own visit to our Benton Harbor resort or would like to discuss all your options, please call us at 269-932-1600 and speak with our knowledgeable agents who will be able to answer all of your questions. Or please fill out the form on this page to send us a message and we will contact you as soon as possible.